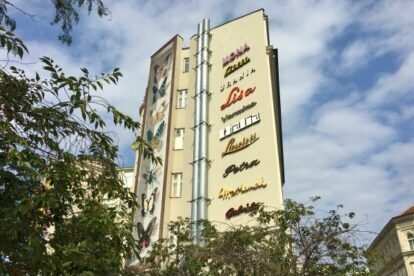 It used to be part of the typical appearance of the city: facade typography signs made out of metal, announcing small, local stores like a bakery, a flower shop or a book store. First put up by the founder of one small business, they were afterwards passed onto next generations, their lifespan just a few decades. Nowadays, small businesses are often being displaced by commercial chains or changing on a regular basis, in accordance with the demands of their residents. This leads to the replacement of traditional facade letterings for printed one-dimensional plastic banners. It’s quite understandable: for an individual owner, plastic banners are easy to handle.They can be switched over a single day, announce the newest sale, they are cheap and uncomplicated to clean. Fortunately, a group of people (Verein Stadtschrift) took notice of this piece of identity slowly disappearing in the urban landscape and decided to collect and carefully store the typographies that were being removed. In 2018 they implemented a public exhibition of facade letterings, all of them female names, on an exterior wall in the sixth district. The rest of their collection can be visited in their showroom in Liniengasse 2a, but you have to get in touch via facebook or email, as they do not have regular opening times.